South Korea is a small country but it is heavily populated. It has a population of over 50 million people. Lots of people visit South Korea for many reasons, including its delicious food, rich culture and beautiful scenery. If you travel to South Korea, there are some fun and important things you should know! Seoul is South Korea's capital. It is located in the northern part of South Korea. It has a population of nearly 10 million people. In this city you can find many tall buildings and skyscrapers. 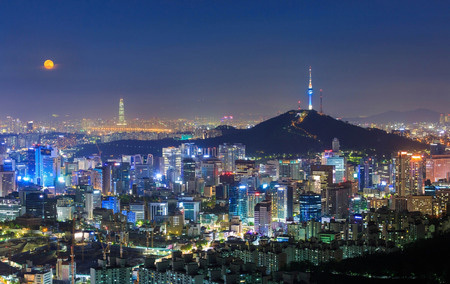 Seoul is known around the world as a technology capital. It has a large subway system. Incheon International Airport is a short forty minute train ride from Seoul. Gangnam, Itaewon and Hongdae are popular neighborhoods in Seoul. Here you can find bustling downtown districts, social life, shopping and great dining. The War Memorial of Korea and Namsan Seoul Tower are popular tourist destinations in Seoul. Busan is the second biggest city in South Korea. It is located on the south coast. People visit Busan for its fresh seafood and beaches. Haedong Yonggungsa is a popular seaside Buddhist temple that many tourists visit. Gamcheon Culture Village is also a very popular tourist destination. It is a bright, colorful village built into a hill in Busan. It has many stairs and is fun to walk through and explore. You can find lots of cafes, art and shops in the culture village. Make sure you bring your camera if you visit! Jeju Island is considered the "Hawaii of Korea." It is a volcanic island located off of the south coast. It is a popular holiday destination for Koreans and their families. Mount Hallasan is a mountain on Jeju. It is a dormant volcano with a 1950 meter summit, making it a popular destination for avid hikers. You can reach Jeju Island by ferry or plane. There are plenty of other cities to visit in South Korea, as well. Other notable cities are Jeonju and Gwangju. Jeonju is a popular heritage destination for tourists and is also the capital city of the Jeollabuk-do province. This province is known for its delicious food. Jeonju is the birthplace of the popular Korean dish, bibimbap! Meanwhile, Gwangju is a cultural historical city with a popular art scene. It is also the birthplace of Korean democracy. If you visit Gwangju, make sure you learn about the protests that took place there in the 1980's. You will learn a lot of interesting facts about South Korean history. South Korea is a popular destination for its delicious food. Korean BBQ is a popular meal around the world. It includes barbequing your own meat on a small grill located at your table. Lots of side dishes (banchans) accompany your meal. These banchans can include anything from kimchi, spicy cucumbers, salads, a variety of veggies or meats. BBQ is the one meal you must try if you visit South Korea. Kimchi is a Korean staple. It accompanies nearly every meal. Every year, Korean families harvest cabbage and make kimchi at home. Kimchi is a fermented cabbage. It is fermented in a spicy red sauce. It makes a delicious addition to any meal! Other popular dishes include bibimbap, dakgalbi, and gimbap. Bibimbap is rice served in a sizzling bowl. It is topped with vegetables and a raw egg that cooks when stirred in the hot pot. Dakgalbi is similar to stir fry. It is prepared at your table with chicken, spicy red sauce and vegetables. It is often topped with ramen noodles and cheese! Gimbap is a Korean version of sushi. Try out a chamchi kimchi gimbap if you go! This is a tuna kimchi Korean sushi roll. South Korea is very mountainous and is also a peninsula surrounded by water. This means there are a variety of activities to keep you busy. Hiking is a very popular activity in Korea. On the weekends, Korean families dress in hiking gear and flock to nearby mountains to spend the day hiking. They will often go as groups and sit on the summit, socializing with their friends and family. Hiking in Korea is always a very fun activity and Koreans you meet on trails will be very happy and welcoming! Because South Korea is surrounded by water, there are many beaches around its coast. On the west coast, you can find popular surfing spots. Koreans also enjoy camping in the summertime. In the winter, families flock to ski hills. There are a variety of popular skiing destinations in South Korea. Korean families like to do a variety of activities and usually keep busy. On the weekends, they often go to bathhouses called jimjabongs. You can sleep in a jimjabong for cheap if you're looking for affordable accommodations. If you choose this route, you will be given a comfortable change of clothes and a mat to roll out on the floor. This is where you will sleep. Sleeping on the floor is a Korean tradition. If you travel as a family, you will probably stay in a place called a pension. This is similar to an apartment or condo. Often these pensions can sleep lots of people but will only have one bed. Instead, you will be given mats to roll out on the floor. Other options for accommodations are hotels, motels and hostels. You can find luxurious hotels and popular chains in big cities. You can also find cheaper options, commonly referred to as "love motels." Here you can find a nice, clean room for somewhere around 30-40 USD. Hostels are the cheaper option, coming in at around 20 USD. South Korea has a very efficient public transit system. You can opt for a train or bus. The train system has a variety of different trains with different speeds. The KTX is the fast train and the ITX is the slower version. The train system has a variety of destinations and is very easy to use. If you cannot get where you need to go via train, the bus is a very good option. It is much cheaper but always on time and fairly comfortable. There will be bus stations in every town in Korea with a variety of options of departure times. Air travel is affordable in South Korea, as well. If you are in a crunch for time, you could choose to fly from Seoul to Busan for not much more than the fast train. If you are travelling to big cities, finding someone who speaks English will be easy. If you are in Seoul or Busan, you will have no problem. However, if you go to a smaller city or a rural part of South Korea, you may need to have some basic understanding of Korean. Picking up a small pocket dictionary is a good idea. Or you can rely on a translator app on your phone. It is also fun to practice a few small words in the local language. Anyonghasayo means "Hello! "Kumsamnida is "thank you." Koreans will appreciate you trying to communicate with them. No matter where you go in South Korea, you will be welcomed with delicious food and beautiful scenery. It is a beautiful country with an interesting history and a rich culture. What is South Korea's population? Why do people commonly travel to South Korea? Where is Mount Hallasan located? Which activity is popular among Koreans? 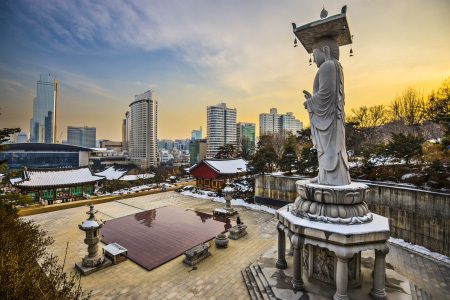 What is South Korea's capital city? Korea is a very large country with a small population. South Korea is a fairly small country geographically with a big population. South Korea is not somewhere you want to visit. 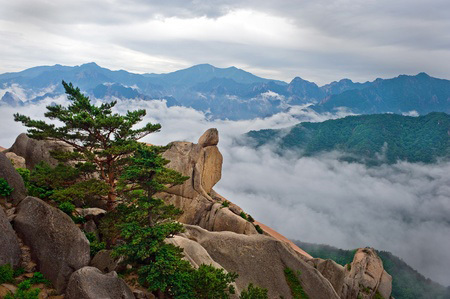 South Korea has many activities like hiking and skiing. You can visit beaches and mountains in South Korea. Not many people in Korea speak English. "South Korea has an island along its south coast that is popular with tourists." "South Korea has terrible public transit systems."